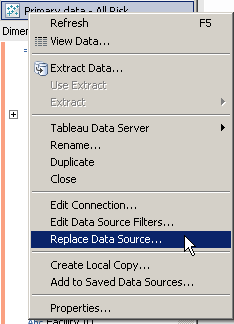 It is easy to change the datasource in Tableau by using "Replace data source" in the data menu. However, this action has some limitations as calculated fields, color formatting etc. is not moved but will revert to the default values. Jonathan Drummey showed this great hack on the community, which is a time saver if you change data source and end up with a lot of work because colors, aliases and other metadata will revert to the default values. The trick is to go inside the XML file behind every Tableau workbook and then swop the section where the data source is defined to a new one. Simply create a workbook with the new connection, open it (with notepad or a similar text-edit tool) and copy/paste the connection string to the existing workbook.